QUEBEC – Toronto’s Wallbridge Mining Co. is drilling very high grades in the newly discovered Habanero zone at its Fenelon gold property. Even better, 41 of the 63 holes drilled to date exhibited visible gold. Hole 18-1075-001: 18.54 g/t gold over 2.27 metres in the Naga Viper zone. These results come from the West Extension area that is the main focus of the company’s surface and underground drilling. Wallbridge is taking a 35,000-tonne bulk sample at Fenelon and having it processed at the nearby Camflo mill. The program is designed to test a few stopes in several zones. Overall grade from the planned stopes averages between 18 and 25 g/t gold. 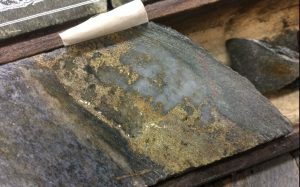 A summary of the recent drill holes is available in the news release dated Sept. 19, 2018, and posted at www.WallbridgeMining.com.